Each year, thousands of kids ask for a bike for the holidays. Why? Because cycling is awesome and receiving a new bike is a special feeling that is like no other feeling in the world - and you and they will never forget it! Whew, we really do love cycling. Many parents and grandparents get this excited about buying a new bike for the special kiddos in their life. 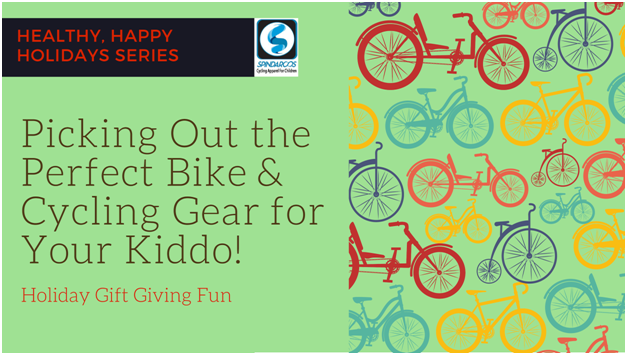 We want to make sure the bike you do pick out for your special child is the perfect one for him or her so they can hop on and head out for a trek around the neighborhood right off the bat! We’ve got a list of items ready to help you pick out the perfect sized bike, nicely fitting helmet and awesome cycling gear. 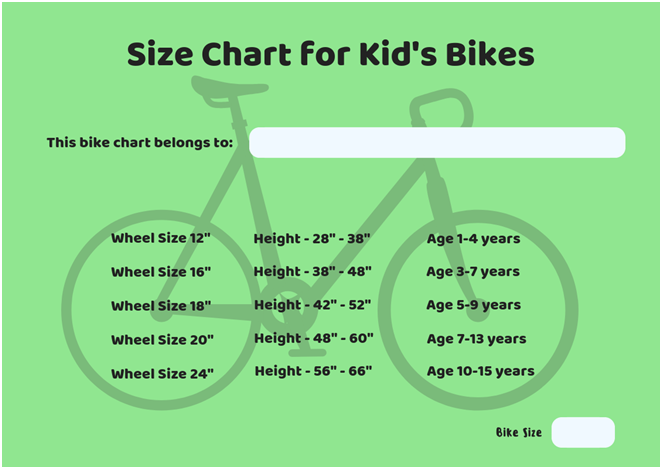 Here’s a handy chart you can print out and take with you, especially if you’re purchase a new bike for more than one child in your life. It’ll help you keep all the details in one place. One big consideration is what safety gear should you have for your kids. 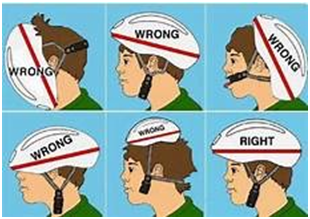 You should most definitely have a helmet for each bike rider. It’s probably a good idea to have your child with you when you’re looking for a good-fitting helmet. The fit should be snug, bu t not too tight, level so it doesn’t fall down or back from their forehead or over their eyes, and stable so it stays in place. Here’s an image that gives you an idea of how it shouldn’t fit and how it should. Show this to the kids - they’ll get a kick out of a couple of these. Spindaroos also has a full line of cycling jerseys. Spin2 Kids is our colorful and dynamic line of cycling apparel for 2 to 12 year old cyclists. We have taken our time in producing graphics that have been chosen by our panel of kid cycling experts, and we have developed a style and fit that is both functional and comfortable to wear. You can find all of our Spin2 Kids jerseys here. For cool weather rides, Spindaroos also has rain jackets and wind jackets to help keep your favorite cyclists warm while they’re riding free in the cool fall and winter weather. A big milestone in a child’s cycling experience is discovering when it might be time to take the training wheels off of their bike. It’s an exciting and liberating decision for a child to take their training wheels off! Some kids are ready and excited in a flash - and some are reluctant for fear of falling off. Either way is OK. Please keep in mind, there is no absolute age that is right for taking training wheels off. It really is about when the child feels confident enough in their riding skills that they feel like they want to give it a try. And sometimes the training wheels come off for 10 minutes, only to go back on for a day or two. That’s alright, too. There is no recipe for this important occasion. And definitely, don’t force your child to take the training wheels off. It should be an organic and natural decision for your child. Once the training wheels are off and they’re riding along more free than they’ve ever felt on their bike, make sure to take note of the look on their face the first time they go down a little hill on their own, or balance and take off on their bike all by themselves. You’ll want to remember the looks on their faces - forever.